Yum! Lots of things are awesome when coated in chocolate. Whatever you are coating, the process is more or less the same. I wanted to post a recipe to show the tempering and coating process step by step and could have used anything, but I decided to go with blueberries. Not many people think about coating blueberries in chocolate. It is not as obvious as strawberries, bananas, or nuts, but it is really delicious. 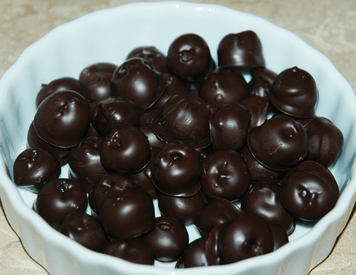 Chocolate covered blueberries is one of my favorite treats.